Background The architectural and morphological adaptations of the hamstrings in response to training with different exercises have not been explored. Purpose To evaluate changes in biceps femoris long head (BFLH) fascicle length and hamstring muscle size following 10-weeks of Nordic hamstring exercise (NHE) or hip extension (HE) training. Methods 30 recreationally active male athletes (age, 22.0±3.6 years; height, 180.4±7 cm; weight, 80.8±11.1 kg) were allocated to 1 of 3 groups: (1) HE training (n=10), NHE training (n=10), or no training (control, CON) (n=10). BFLH fascicle length was assessed before, during (Week 5) and after the intervention with a two-dimensional ultrasound. Hamstring muscle size was determined before and after training via MRI. 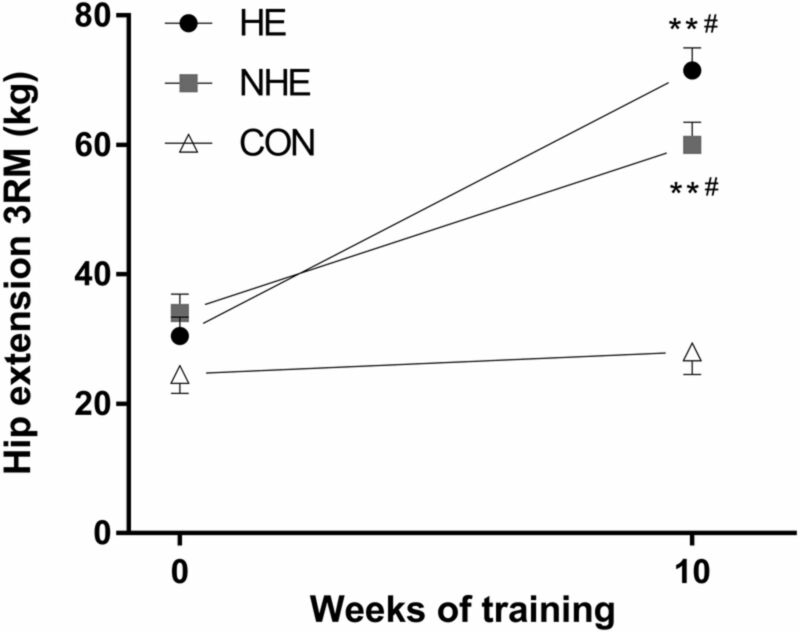 Results Compared with baseline, BFLH fascicles were lengthened in the NHE and HE groups at mid-training (d=1.12–1.39, p<0.001) and post-training (d=1.77–2.17, p<0.001) and these changes did not differ significantly between exercises (d=0.49–0.80, p=0.279–0.976). BFLH volume increased more for the HE than the NHE (d=1.03, p=0.037) and CON (d=2.24, p<0.001) groups. Compared with the CON group, both exercises induced significant increases in semitendinosus volume (d=2.16–2.50, ≤0.002) and these increases were not significantly different (d=0.69, p=0.239). 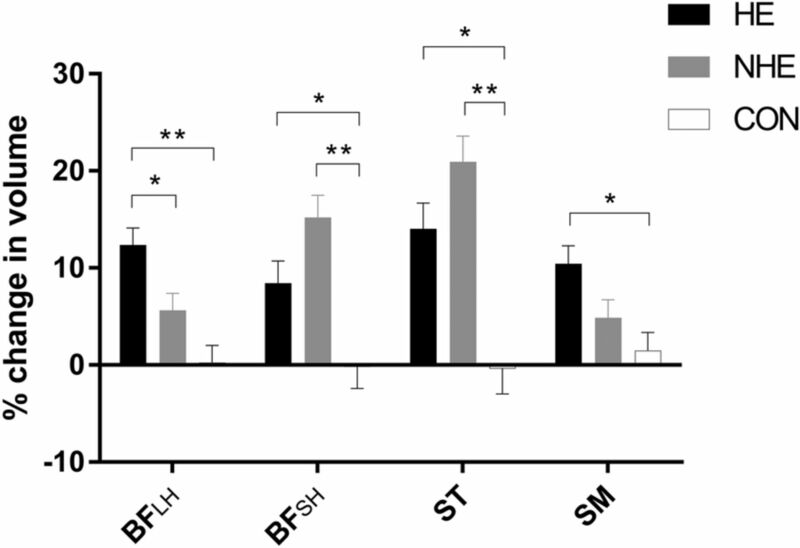 Conclusion NHE and HE training both stimulate significant increases in BFLH fascicle length; however, HE training may be more effective for promoting hypertrophy in the BFLH. Hamstring ‘tears’ are endemic in sports involving high-speed running and upwards of 80% of these injuries involve the biceps femoris long head (BFLH).1–4 Hamstring strains represent the most common injury in athletics,5 Australian Rules Football,6 ,7 and soccer8 and as many as 30% reoccur within 12 months.9 These findings highlight the need for improved hamstring injury prevention programmes while also suggesting the possibility that these programmes should specifically target the BFLH. There has been significant interest in exploring the patterns of muscle activity in hamstring exercises;10–15 however, there is no research examining the architectural and morphological adaptations of these muscles to different exercise interventions. The Nordic hamstring exercise (NHE) has proven effective in increasing eccentric knee flexor strength16 and reducing hamstring injuries17–19 in soccer, although there is disagreement in the literature as to which hamstring muscles are most active during this exercise.10 ,14 ,15 ,20 We have previously reported that the NHE preferentially activates the semitendinosus (ST);10 ,15 however, we have also observed high levels of BFLH activity in this exercise,15 which suggests that it may still provide a powerful stimulus for adaptation within this most commonly injured muscle.1–4 Eccentric exercise has been proposed to increase muscle fascicle lengths via sarcomerogenesis21 ,22 and Timmins et al23 have recently observed such an adaptation after eccentric knee flexor training on an isokinetic dynamometer while also noting that concentric training caused fascicle shortening despite training occurring at long muscle lengths. Furthermore, we have recently reported that soccer players with shorter BFLH fascicles (<10.56 cm) were at fourfold greater risk of hamstring strain injury than players with longer fascicles.23 Given the effectiveness of the predominantly eccentric NHE in hamstring injury prevention and rehabilitation,17–19 it is of interest to examine the impact of this and alternative exercises on BFLH fascicle lengths and morphology. The primary purpose of this study was to evaluate changes in BFLH architecture and hamstring muscle volume and anatomical cross-sectional area (ACSA) following 10-week resistance training programmes consisting exclusively of NHE or HE training. We tested the hypotheses that (1) HE training would stimulate greater increases in BFLH fascicle length than the NHE, on the basis of the suggestion that the ‘elongation stress’ in hamstring exercises may be an important factor in triggering this adaptation;24 (2) HE training would promote more BFLH hypertrophy than the NHE and (3) the NHE would result in more hypertrophy of the ST muscle than the HE exercise. Thirty recreationally active men (age, 22.0±3.6 years; height, 180.4±7 cm; weight, 80.8±11.1 kg) provided written informed consent to participate in this study. Participants were free from soft tissue and orthopaedic injuries to the trunk, hips and lower limbs and had no known history of hamstring strain, anterior cruciate ligament or other traumatic knee injury. Before enrolment in the study, all participants completed a cardiovascular screening questionnaire and a standard MRI questionnaire to ensure it was safe for them to enter the magnetic field. This study was approved by the Queensland University of Technology Human Research Ethics Committee and the University of Queensland Medical Research Ethics Committee. This longitudinal training study was conducted between April and June, 2015. Almost 1 week before the intervention started, participants underwent MR and two-dimensional (2D) ultrasound imaging of their posterior thighs to determine hamstring muscle size and BFLH architecture, respectively. After scanning, all participants were familiarised with the NHE and 45° HE exercise and subsequently underwent strength assessments on each exercise. After all of the pretraining assessments had been completed, participants were allocated to one of three groups: NHE, HE or control (CON). Allocation of participants to groups was performed on the basis of baseline BFLH fascicle lengths to ensure that groups did not differ in this parameter prior to initiation of the study. Of the three participants with the longest fascicles, the first (with the longest fascicles) was allocated randomly to one of the three groups and then the second was allocated at random to one of the remaining two groups and the third was allocated to the remaining group. This process was repeated for the participants with the fourth to sixth longest fascicles, the seventh to ninth longest fascicles and so forth until each group had 10 participants. The NHE and HE groups completed a 10-week progressive strength training programme consisting exclusively of their allocated exercise (table 1). The CON group was advised to continue their regular physical activity levels but not to engage in any resistance training for the lower body. At the beginning of every training session, participants in both training groups reported their level of perceived soreness in the posterior thigh using a 1–10 numeric pain rating scale. All CON participants were required to report to the laboratory at least once per week. For all participants, BFLH architecture was reassessed 5 weeks into the intervention and within 5 days of the final training session. MRI scans were acquired for all participants <7 days after the final training session. Strength testing was conducted after all imaging had been completed. An illustration of the NHE can be found in figure 1A (see online supplementary video 1). Participants knelt on a padded board, with the ankles secured immediately superior to the lateral malleolus by individual ankle braces which were attached to uniaxial load cells. The ankle braces and load cells were secured to a pivot which allowed the force generated by the knee flexors to be measured through the long axis of the load cells. From the initial kneeling position with their ankles secured in yokes, arms on the chest and hips extended, participants lowered their bodies as slowly as possible to a prone position.10 Participants performed only the lowering (eccentric) portion of the exercise and were instructed to use their arms and flex at the hips and knees to push back into the starting position so as to minimise concentric knee flexor activity. When the participants developed sufficient strength to completely stop the movement in the final 10–20° of the range of motion, they were required to hold a weight plate (range 2.5–20 kg) to their chest (centred to the xiphoid process) to ensure the exercise was still of supramaximal intensity. Participants were allowed 3 min of rest between each set. 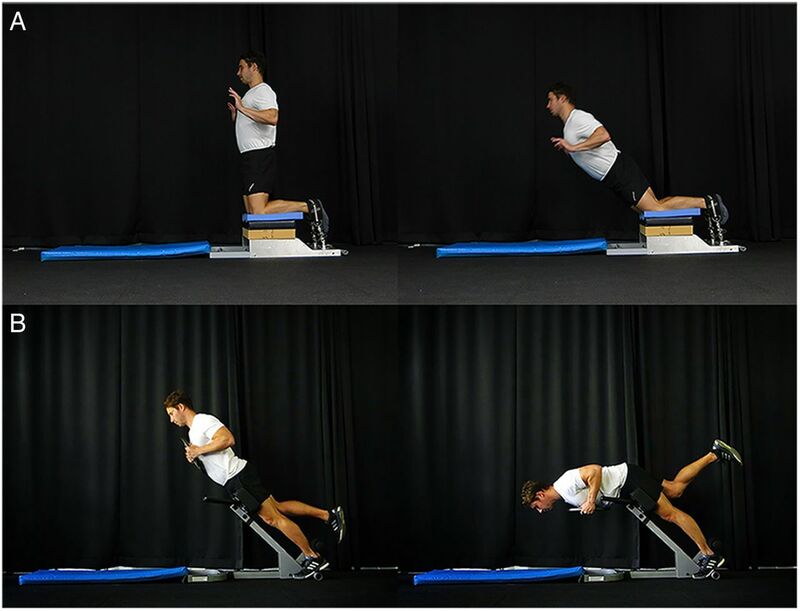 (A) The Nordic hamstring exercise (NHE) and (B) the 45° hip extension (HE) exercise, progressive from left to right. Participants were positioned in a 45° HE machine (BodySolid, Illinois, USA) with their trunk erect and hip joints extended and superior to the level of support pad (figure 1B; see online supplementary video 2). The ankle of the exercised limb was ‘hooked’ under an ankle pad and the unexercised limb was allowed to rest above its ankle restraint. Participants held one or more circular weight plate(s) to the chest (centred to the xiphoid process) and were instructed to flex their hip until they reached a point ∼90° from the starting position. Once the participants had reached this position they were instructed to return to the starting position by extending their hip, while keeping their trunk in a rigid neutral position throughout. Both limbs were trained in alternating fashion; after completing a set on one limb participants rested for 30 s before training the opposite limb, and then recovered for 3 min before the next set. The load held to the chest in week 1 represented 60–70% of the estimated one-repetition maximum (1-RM) and was progressively increased throughout the training period whenever the prescribed repetitions and sets could be completed with appropriate technique (table 2). Participants in both intervention groups completed a progressive intensity training programme consisting of 20 supervised exercise sessions (2 per week) over the 10-week period (tables 1 and 2). Each session was followed by at least 48 hours of recovery and participants were prohibited from engaging in any other resistance training for the lower body. The training programme was based on the approximate loads, repetitions and sets employed in previous interventions using the NHE,16–18 although the volume (number of repetitions) was reduced in the final 2 weeks to accommodate increases in exercise intensity. All sessions were conducted in the same laboratory, employed the same exercise equipment and were supervised by the same investigators (MNB and SJD) to ensure consistency of procedures. Before and <7 days after the intervention, all participants underwent an assessment of their maximal eccentric knee-flexor strength during three repetitions of the NHE, and their 3-RM strength on the 45° HE machine. All strength tests were conducted by the same investigators (MNB, SJD and AJS) with tests completed almost the same time of day before and after the intervention. The assessment of eccentric knee flexor force using the NHE has been reported previously.3 ,4 ,23 ,26 Participants completed a single warm-up set of five submaximal repetitions followed, 1 min later, by a set of 3 maximal repetitions of the bilateral NHE. Eccentric strength was determined for each leg from the highest of three peak forces produced during the three repetitions of the NHE and was reported in absolute terms (N). All strength assessments on the 45° HE machine were conducted unilaterally. Participants initially warmed up by performing 8–10 repetitions on each leg using body weight only. Subsequently, loads held to the chest were progressively increased until investigators determined the maximal load that could be lifted three times. At least 2 min of rest was provided between sets. BFLH fascicle length was determined from the ultrasound images taken along the longitudinal axis of the muscle belly using a 2D, B-mode ultrasound (frequency, 12 MHz; depth, 8 cm; field of view, 14×47 mm) (GE Healthcare Vivid-i, Wauwatosa, USA). The participants were positioned prone on a plinth with their hips in neutral and knees fully extended, while images were acquired from a point midway between the ischial tuberosity and the knee-joint fold, parallel to the presumed orientation of BFLH fascicles. After the scanning site was determined, the distance of the site from various anatomical landmarks were recorded to ensure its reproducibility for future testing sessions. These landmarks included the ischial tuberosity, head of the fibula and the posterior knee-joint fold at the midpoint between biceps femoris and ST tendon. On subsequent visits the scanning site was determined and marked on the skin and then confirmed by replicated landmark distance measures. Images were obtained from both limbs following at least 5 min of inactivity. To gather ultrasound images, the linear array ultrasound probe, with a layer of conductive gel was placed on the skin over the scanning site, aligned longitudinally and perpendicular to the posterior thigh. Care was taken to ensure minimal pressure was placed on the skin by the probe as this may influence the accuracy of the measures.27 The orientation of the probe was manipulated slightly by the sonographer (RGT) if the superficial and intermediate aponeuroses were not parallel. where FL=fascicle length, AA=aponeurosis angle, MT=muscle thickness and PA=pennation angle. A two-dimensional ultrasound image of the biceps femoris long head (BFLH), taken along the longitudinal axis of the posterior thigh. 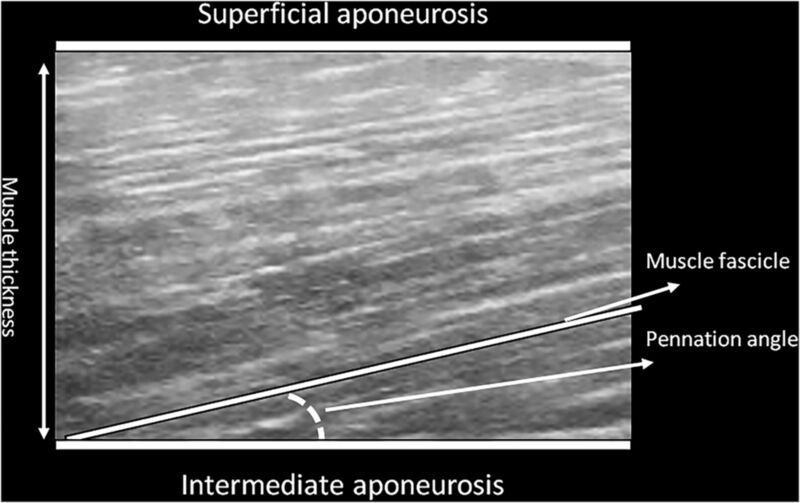 From these images, it is possible to determine the superficial and intermediate aponeuroses, muscle thickness and the angle of the fascicle in relation to the aponeurosis. Estimates of fascicle length can then be made via trigonometry using muscle thickness and pennation angle. Muscle volumes and ACSA assessment: All MRI scans were performed using a 3-Tesla (3T) (Siemens TrioTim, Germany) imaging system with a spinal coil. The participant was positioned supine in the magnet bore with the knees fully extended and hips in neutral, and straps were placed around both limbs to prevent any undesired movement. Contiguous T1-weighted axial MRIs (transverse relaxation time: 750 ms; echo time: 12 ms; field of view: 400 mm; slice thickness: 10 mm; interslice distance: 0 mm) were taken of both limbs beginning at the iliac crest and finishing distal to the tibial condyles. A localiser adjustment (20s) was applied prior to the acquisition of T1-weighted images to standardise the field of view. In addition, to minimise any inhomogeneity in MRIs caused by dielectric resonances at 3T, a postprocessing (B1) filter was applied to all scans.31 The total scan duration was 3 min 39 s.
Muscle volumes and ACSAs of the BFLH and short head (BFSH), ST and semimembranosus (SM) muscles were determined for both limbs using manual segmentation. Muscle boundaries were identified and traced on each image in which the desired structure was present using image analysis software (Sante DICOM Viewer and Editor, Cornell University) (figure 3). Volumes were determined for each muscle by multiplying the summed cross-sectional areas (CSA) (from all the slices containing the muscle of interest) by the slice thickness.25 ACSA was determined by locating the 10 mm slice with the greatest CSA and averaging this along with the two slices immediately cranial and caudal (5 slices). All traces (pretraining and post-training) were completed by the same investigator (MNB) who was blinded to participant identity and training group in all post-testing. T1-weighted image (transverse relaxation time=750 ms; echo time=12 ms; slice thickness=10 mm), depicting the regions of interest for each hamstring muscle. The right side of the image corresponds to the participant's left side as per radiology convention. BFLH, biceps femoris long head; BFSH, biceps femoris short head; SM, semimembranosus; ST, semitendinosus. All statistical analyses were performed using SPSS V.22.0.0.1 (IBM Corporation, Chicago, Illinois, USA). Repeated measures split plot analysis of variances (ANOVAs) were used to determine training-induced changes in BFLH architecture, hamstring muscle volumes and ACSA, strength, and ratings of perceived soreness, for each group. For the analysis of BFLH fascicle length, the within-subject variable was time (baseline, mid-training, and post-training) and the between-subject variable was group (HE, NHE, CON). Since BFLH architecture did not differ between limbs (dominant vs non-dominant) at any time point (p>0.05), the left and right limbs were averaged to provide a single value for each participant. 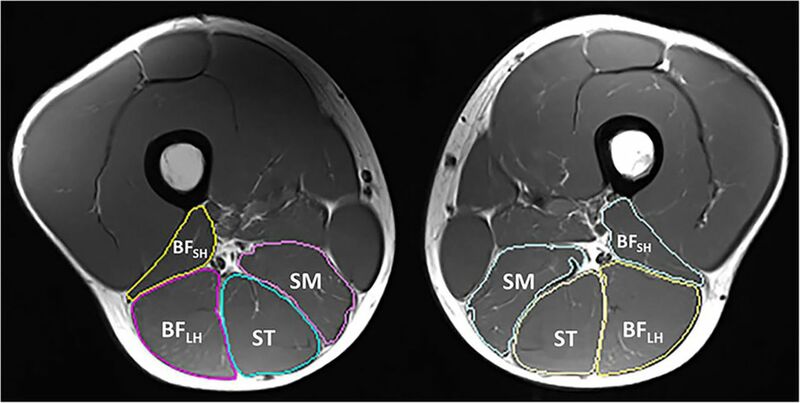 To determine differences in the percentage change in hamstring muscle volume and ACSA between groups, the within-subject variable was muscle (BFLH, BFSH, ST and SM) and the between-subject variable was group (HE, NHE, CON). To explore changes in Nordic and 45° HE strength the within-subject variable was time (baseline and post-training) and the between-subject variable was group (HE, NHE, CON). Finally, to determine whether ratings of perceived soreness changed over time, or differed between training groups, the within-subject variable was time (weeks 1–10) and the between-subject variable was group (HE, NHE, CON). For all analyses, when a significant main effect was detected, post hoc independent Student's t-tests with Bonferroni corrections were used to determine which comparisons differed. For all analyses, the mean differences were reported with their 95% CIs, and where appropriate, Cohen's d was reported as a measure of the effect size. A priori sample size estimates were based on anticipated differences in BFLH fascicle length following the training intervention. A sample size of 10 in each group was calculated to provide sufficient statistical power (80%) to detect an effect size of 1.0 for the difference in fascicle length changes between training groups, with p<0.05. No significant differences were observed in age, height or body mass between the three groups (p>0.05) (table 3). Compliance rates were excellent for both training groups (HE: 100%; NHE: 99.5%). A significant group×time interaction was observed for fascicle length during the training period (p<0.001) (figure 4). No significant differences were observed between training groups at either baseline (d=0.15), mid-training (d=0.49) or post-training points (d=0.80) (all p>0.05). 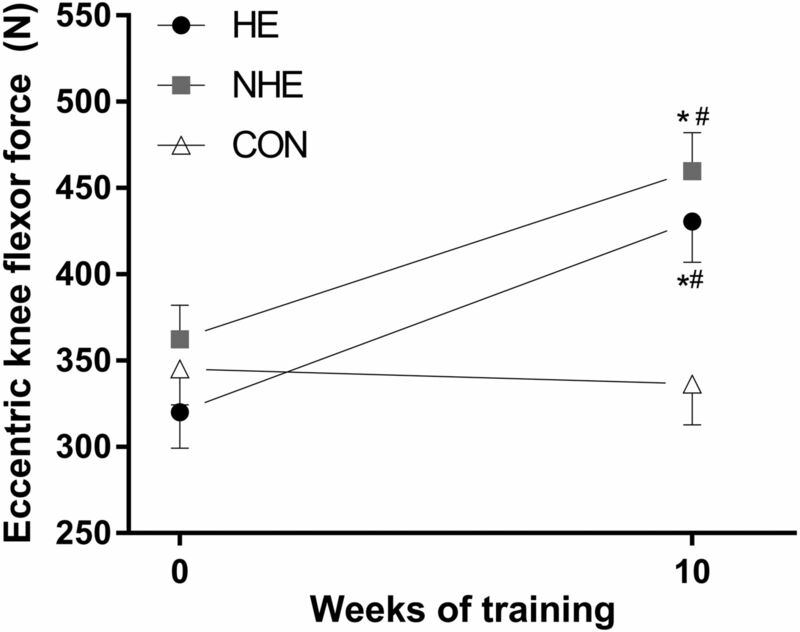 However, the NHE group displayed significantly longer fascicles than the CON group at mid-training (mean difference=1.50 cm, 95% CI 0.58 to 2.41 cm, d=1.64, p=0.001) and post-training (mean difference=2.40 cm, 95% CI 1.28 to 3.53 cm, d=2.19, p<0.001). Similarly, the HE group exhibited significantly longer fascicles than the CON group at mid-training (mean difference=1.14 cm, 95% CI 0.22 to 2.05 cm, d=1.52, p=0.011) and post-training (mean difference=1.63 cm, 95% CI 0.51 to 2.76 cm, d=1.84, p=0.003). Biceps femoris long head (BFLH) fascicle lengths before (baseline), during (mid-training) and after (post-training) the intervention period for the hip extension (HE), Nordic hamstring exercise (NHE) and control (CON) groups. Fascicle length is expressed in absolute terms (cm) with error bars depicting SE. * Indicates p<0.05 compared with baseline (week 0). ** Signifies p<0.001 compared with baseline. # Indicates p<0.05 compared with the CON group. Post hoc analyses revealed that BFLH fascicle length increased significantly from baseline in the NHE group at mid-training (mean difference=1.23 cm, 95% CI 0.84 to 1.63 cm, d=1.39, p<0.001) and post-training (mean difference=2.22 cm, 95% CI 1.74 to 2.69 cm, d=2.17, p<0.001). The HE group also displayed significantly lengthened fascicles at mid-training (mean difference=0.75 cm, 95% CI 0.35 to 1.15 cm, d=1.12, p<0.001) and post-training (mean difference=1.33 cm, 95% CI 0.86 to 1.80 cm, d=1.77, p<0.001). However, the CON group remained unchanged relative to baseline values at all time points (p>0.05, d=0.20–0.31). A significant main effect was detected for the muscle×group interaction for hamstring muscle volume changes (p<0.001) (figure 5). BFLH volume increased significantly more in the HE than the NHE (mean difference=6.72%, 95% CI 0.32% to 13.11%, d=1.03, p=0.037) and CON groups (mean difference=12.10%, 95% CI 5.71% to 18.50%, d=2.24, p<0.001), and a smaller non-significant difference was observed between the NHE and CON groups (mean difference=5.39%, 95% CI −1.01% to 11.78%, d=1.13, p=0.122) (figure 5). BFSH volume increased more in the HE (mean difference=8.51%, 95% CI 0.17% to 16.85%, d=1.49, p=0.044) and NHE groups (mean difference=15.29%, 95% CI 6.95% to 23.63%, d=2.09, p<0.001) than in the CON group. Both the NHE (mean difference=21.21%, 95% CI 11.55% to 30.88%, d=2.50, p<0.001) and HE (mean difference=14.32%, 95% CI 4.65% to 23.98%, d=2.16, p=0.002) training groups exhibited a greater increase in ST volume than the CON group. However, no significant difference in ST volume change was noted between NHE and HE groups (mean difference=6.90%, 95% CI −2.77% to 16.56%, d=0.69, p=0.239). The percentage change in volume for the SM was significantly greater for the HE group than for CON (mean difference=8.95%, 95% CI 2.21% to 15.69%, 1.57, p=0.007), while no difference was observed between the NHE and CON group changes (mean difference=3.38%, 95% CI −3.36% to 10.12%, d=0.68, p=0.636) for this muscle. Percentage change in volume (cm3) for each hamstring muscle after the intervention period for the HE, NHE and CON groups. Values are expressed as a mean percentage change compared with the values at baseline with error bars representing SE. For all pairwise comparisons between groups, * indicates p<0.05 and ** signifies that p<0.001. BFLH, biceps femoris long head; BFSH, biceps femoris short head; CON, control; HE, hip extension; NHE, Nordic hamstring exercise; SM, semimembranosus; ST, semitendinosus. HE training stimulated a greater increase in volume for the ST than the BFSH (mean difference=5.61%, 95% CI 1.12% to 10.10%, d=0.71, p=0.009). No other significant between-muscle differences were noted for volume changes after HE training (p=0.054–0.999 for all pairwise comparisons) or in the CON group (p>1.000). After NHE training, ST volume increased more than BFLH (mean difference=15.28%, 95% CI 10.69% to 19.87%, d=3.54, p<0.001) and SM (mean difference=16.06%, 95% CI 10.96% to 21.16%, d=3.53, p<0.001). Similarly, in the NHE group the percentage change in volume was greater for the BFSH than the BFLH (mean difference=9.56%, 95% CI 4.30% to 14.80%, d=1.18, p<0.001) and SM (mean difference=10.33%, 95% CI 5.33% to 15.34%, d=1.26, p<0.001). A significant main effect was detected for the muscle×group interaction (p<0.001) (figure 6). The percentage change in BFLH ACSA was greater in the HE training group than in the NHE (mean difference=5.24%, 95% CI 0.061% to 10.41%, d=0.98, p=0.047) and CON groups (mean difference=8.90%, 95% CI 3.73% to 14.07%, d=1.94, p<0.001), while no difference was observed between the NHE and CON groups (mean difference=3.67%, 95% CI −1.51% to 8.84%, d=1.07, p=0.245) (figure 6). BFSH ACSA increased significantly more in the NHE than the CON group (mean difference=13.26%, 95% CI 4.98% to 21.54%, d=1.97, p=0.001), while no difference was observed between changes exhibited by the HE and CON groups for this muscle (mean difference=5.69%, 95% CI −2.59% to 13.96%, d=0.90, p=0.273). The percentage change in ST ACSA was significantly greater in the NHE (mean difference=17.60%, 95% CI 7.60% to 27.61%, d=2.17, p<0.001) and HE (mean difference=15.16%, 95% CI 5.15% to 25.17%, d=1.95, p=0.002) groups than the CON group, however no significant difference was noted between changes in the NHE and HE groups (mean difference=2.4%, 95% CI −7.57% to 12.45%, d=0.24, p=1.000). The percentage increase in SM ACSA was greater in the HE than the CON group (mean difference=7.19%, 95% CI 1.21% to 13.18%, d=1.34, p=0.015), but was not significantly greater in NHE than CON (mean difference=2.02%, 95% CI −3.97% to 8.01%, d=0.49, p=1.000). No significant difference in SM ACSA change was noted between the HE and NHE groups (main difference=5.17%, 95% CI −8.2% to 11.16%, d=0.85, p=0.109). Percentage change in ACSA (cm2) for each hamstring muscle after the intervention period for the HE, NHE and CON groups. Values are expressed as a mean percentage change compared with the values at baseline with error bars representing SE. For all pairwise comparisons between groups, * indicates p<0.05 and ** signifies that p<0.001. ACSA, anatomical cross-sectional area; BFLH, biceps femoris long head; BFSH, biceps femoris short head; CON, control; HE, hip extension; NHE, Nordic hamstring exercise; SM, semimembranosus; ST, semitendinosus. After HE training, the change in ACSA observed for the ST was significantly greater than the BFLH (mean difference=6.46, 95% CI 0.84% to 12.10%, d=0.78, p=0.017), BFSH (mean difference=9.98%, 95% CI 4.25% to 15.71%, d=1.09, p<0.001) and SM (mean difference=6.73%, 95% CI 1.54% to 11.92%, d=0.78, p=0.006). No other significant pairwise between-muscle differences in ACSA change were noted after HE training (all p>0.05). After NHE training, the change in ACSA was greater for BFSH than BFLH (mean difference=9.30%, 95% CI 3.47% to 15.12%, d=1.34, p=0.001) and SM (mean difference=9.50%, 95% CI 4.92% to 14.08%, d=1.33, p<0.001), while ST ACSA increased more than BFLH (mean difference=14.14%, 95% CI 8.52% to 19.76%, d=1.76, p<0.001) and SM (mean difference=14.35%, 95% CI 9.15% to 19.54%, d=1.75, p<0.001). A significant group×time interaction effect was observed for the Nordic eccentric strength test (p<0.001) (figure 7). Post hoc Student's t-tests demonstrated that the NHE (mean difference=97.38N, 95% CI 65.51 to 129.26N, d=2.36, p<0.001) and HE (mean difference=110.47N, 95% CI 76.87 to 144.07N, d=1.26, p<0.001) groups were significantly stronger at post-training compared with baseline while the CON group did not change (mean difference=8.91N, 95% CI −42.51 to 24.69N, d=0.14, p=0.590). No groups differed at baseline (p>0.461), however, at post-training the NHE (mean difference=123.43N, 95% CI 39.93 to 206.93N, d=2.07, p=0.003) and HE (mean difference=94.27N, 95% CI 8.60 to 179.94N, d=1.14, p=0.028) groups were both significantly stronger than the CON group. No significant difference was observed between training groups at post-training (mean difference=29.16N, 95% CI −54.34 to 112.66N, d=0.41, p=0.999). Eccentric knee flexor force measured during the Nordic strength test before (baseline) and after (post-training) the intervention period for the hip extension (HE), Nordic hamstring exercise (NHE) and control (CON) groups. Force is reported in absolute terms (N) with error bars depicting SE. * Indicates p<0.001 compared with baseline (week 0). # Signifies p<0.05 compared with the CON group. A significant group×time interaction effect was also observed for 3-RM strength as assessed during the 45° HE strength test (p<0.001) (figure 8). Post hoc analyses demonstrated that the HE (mean difference=41.00 kg, 95% CI 35.97 to 46.03 kg, d=4.59, p<0.001) and NHE groups (mean difference=26.00 kg, 95% CI 20.97 to 31.03 kg, d=2.36, p<0.001) improved significantly from baseline whereas the CON group did not change (mean difference=3.50 kg, 95% CI −1.53 to 8.53 kg, d=0.33, p=0.165). No groups differed significantly at baseline (p>0.091); however, at post-training, both the HE (mean difference=43.50 kg, 95% CI 30.93 to 56.07 kg, d=4.21, p<0.001) and NHE groups (mean difference=32.0 kg, 95% CI 19.43 to 44.57 kg, d=2.66, p<0.001) were significantly stronger than CON. Post-training, no significant difference was observed between training groups (mean difference=11.50 kg, 95% CI −1.07 to 24.07 kg, d=1.09, p=0.082). Hip extension (HE) three-repetition maximum (3RM) before (baseline) and after (post-training) the intervention period for the HE, Nordic hamstring exercise (NHE) and control (CON) groups. Force is reported in absolute terms (kg) with error bars depicting SE. ** Indicates p<0.001 compared with baseline (week 0). # Signifies p<0.001 compared with the CON group. No significant group×time interaction effect (p=0.397) was detected for ratings of perceived soreness throughout the intervention (figure 9). The average soreness measures reported across the 10-week training period were 2.2±0.4 (mean±SE) for the NHE group and 2.3±0.5 for the HE group. Mean (±SE) weekly soreness measured using a numeric pain rating scale (1–10) at the beginning of each training session for the hip extension (HE) and Nordic hamstring exercise (NHE) groups. This study is the first to explore the architectural and morphological adaptations of the hamstrings in response to different strength training exercises. These data suggest that both the HE and NHE stimulate significant increases in BFLH fascicle length and, contrary to our hypothesis, that the longer muscle lengths encountered in the HE exercise do not result in greater lengthening of fascicles than are observed after NHE training. As hypothesised, HE training appears to elicit more hypertrophy in the BFLH than does the NHE; while contrary to our hypothesis, the NHE was not significantly more effective at increasing ST volume or cross-sectional area than the HE. Both exercises resulted in significant strength increases, which were similarly evident in the NHE and HE strength tests. Fascicle lengthening is one possible mechanism by which the NHE17–19 and other eccentric or long-length hamstring exercises22 protect muscles from injury. We have recently shown, prospectively, that professional soccer players with fascicles <10.56 cm were ∼4 times more likely to suffer a hamstring strain than athletes with longer fascicles and that the probability of injury was reduced by ∼74% for every 0.5 cm increase in fascicle length.23 In the current study, participants increased their fascicle lengths from ∼10.6 cm prior to training, to 12.8 and 12.0 cm in the NHE and HE groups, respectively, which would likely result in large reductions in hamstring injury risk. Despite its success in reducing hamstring strain injuries, the adoption of the NHE in elite European soccer has been reported to be poor with only ∼11% of Norwegian premier league and Union of European Football Associations teams deemed to have adequately implemented the NHE programmes that have proven effective in randomised controlled trials.17–19 Some conditioning coaches and researchers24 believe that the exercise does not challenge the hamstrings at sufficient lengths to optimise injury prevention benefits. However, this study shows, for the first time, that the limited excursion of the hamstrings during the NHE does not prevent the exercise from increasing BFLH fascicle length. Indeed, the exercise resulted in greater fascicle lengthening than the HE, although the current study lacked the statistical power to distinguish between the two. Together with observations that long-length concentric hamstring training can shorten muscle fascicles,32 the current findings are consistent with the possibility that the combination of concentric and eccentric contractions somewhat dampens the elongation of BFLH fascicles. The advantage of the NHE may be its almost purely eccentric or eccentrically-biased nature. Further work is needed to clarify whether eccentrically-biased or purely eccentric HE exercise may yield greater improvements in BFLH fascicle length than the combined concentric and eccentric contraction modes used in this investigation. Observations of increased fascicle length following eccentric hamstring exercise are largely consistent with the existing literature. For example, Potier et al33 reported a 34% increase in BFLH fascicle length following 8 weeks of eccentric leg curl exercise, while Timmins et al32 reported a 16% increase in BFLH fascicle length after 6 weeks of eccentric training on an isokinetic dynamometer.32 These adaptations most likely result from the addition of in-series sarcomeres, as has been shown to occur within the rat vastus intermedius muscle after 5 days of downhill running.34 It has been proposed that this increase in serial sarcomeres accounts for both a rightward shift in a muscle's force-length relationship,35 while also reducing its susceptibility to damage.21 ,22 However, it is also at least theoretically possible that fascicle lengthening occurs as a result of increased tendon or aponeurotic stiffness36 and further research is needed to clarify the precise mechanism(s) responsible for these architectural changes. To the authors' knowledge, this is the first study to explore the morphological adaptations of the hamstrings to different strengthening exercises. These data suggest that the NHE and HE exercises induce heterogeneous patterns of hamstring muscle hypertrophy, with the former preferentially stimulating ST and BFSH growth and the latter resulting in significantly more hypertrophy of the BFLH and more homogenous growth of all two-joint hamstring muscles. We have previously noted transient T2 relaxation time changes after 50 repetitions of each of these exercises that almost exactly fit this pattern,15 so it appears that the acute changes observed via functional MRI match quite well with the hypertrophic effects observed after 10 weeks of training. However, neither muscle volume nor ACSA have been identified as risk factors for hamstring strain injury, so the exact significance of these findings is unknown. Indeed, we have previously reported that BFLH muscle thickness measured via ultrasound is not a risk factor for hamstring injury in elite soccer.23 Nevertheless, BFLH muscle atrophy has been noted as long as 5–23 months after injury in recreational athletes,25 so unilateral HE exercises may prove more beneficial than the NHE at redressing this deficit in rehabilitation. Interestingly, reduced muscle volumes of the ST have been observed 12–72 months after anterior cruciate ligament injury37 and the results of the current investigation suggest that the NHE may be valuable in rehabilitation of this injury. Hamstring strengthening is an important component of injury prevention strategies.24 ,38 ,39 Indeed, several large scale interventions employing the NHE have shown ∼65% reductions in hamstring strain injury rates in soccer17–19 and recent prospective findings in elite Australian football3 and soccer23 suggest that eccentric strength improvements like those reported here and previously16 are at least partly responsible for these protective benefits. For example, elite athletes in these sports who generated <279N (Australian football) and <337N (soccer) of knee flexor force at the ankles during the NHE strength test were ∼4 times more likely to sustain hamstring injuries than stronger counterparts.3 ,23 In this study, our recreational level athletes were able to generate, on average, 460N and 431N after 10 weeks of NHE and HE training, respectively, making them substantially stronger than these elite Australian football3 and soccer players.23 Significant improvements in 3-RM HE strength were also observed for both training groups, which suggests that hamstring strengthening, at least in recreationally trained athletes, is not highly specific to the chosen exercise. While the benefits of high levels of HE strength remain unclear from the perspective of injury prevention, the observed effects of HE training on BFLH fascicle lengths and eccentric knee flexor strength suggest the potential for this exercise to reduce injury risk. Future intervention studies analogous to those employing the NHE previously,17–19 ,40 are needed to clarify whether HE training is effective in reducing hamstring strain injuries; however, access to exercise equipment (ie, a 45° HE machine) may be a limiting factor in designing such studies. It is also noteworthy that strength improvements can be achieved with very modest levels of hamstring muscle soreness when training is appropriately structured and progressively overloaded. These observations are in agreement with Mjolsnes et al16 who have previously reported very limited muscle soreness with a gradual increase in NHE volume. The authors acknowledge that there are some limitations associated with the current study. First, muscle architecture was only assessed in the BFLH and it may not be appropriate to generalise these findings to other knee flexors, given that each hamstring muscle displays unique architectural characteristics.41 Further, the assessment of fascicle length using 2D ultrasound requires some degree of estimation, because the entire length of the BFLH fascicles are not visible in ultrasound images. While the estimation equation used in this study has been validated against cadaveric samples,29 there is still the potential for error, and future studies employing extended field-of-view ultrasound methods may be needed to completely eliminate this. Finally, all the athletes in this study were recreational level men of a similar age, and it remains to be seen if these results are applicable to other populations. However, our participants were, on average, as strong as elite Australian football players3 and stronger than professional soccer players23 at the start of the study. Furthermore, our cohort displayed average fascicle lengths before training that were within one SD of the values reported in elite soccer players previously,23 so it is unlikely that they were unrepresentative of higher level athletes, in these parameters at least. This is the first study to demonstrate that training with different exercises elicits unique architectural and morphological adaptations within the hamstring muscle group. 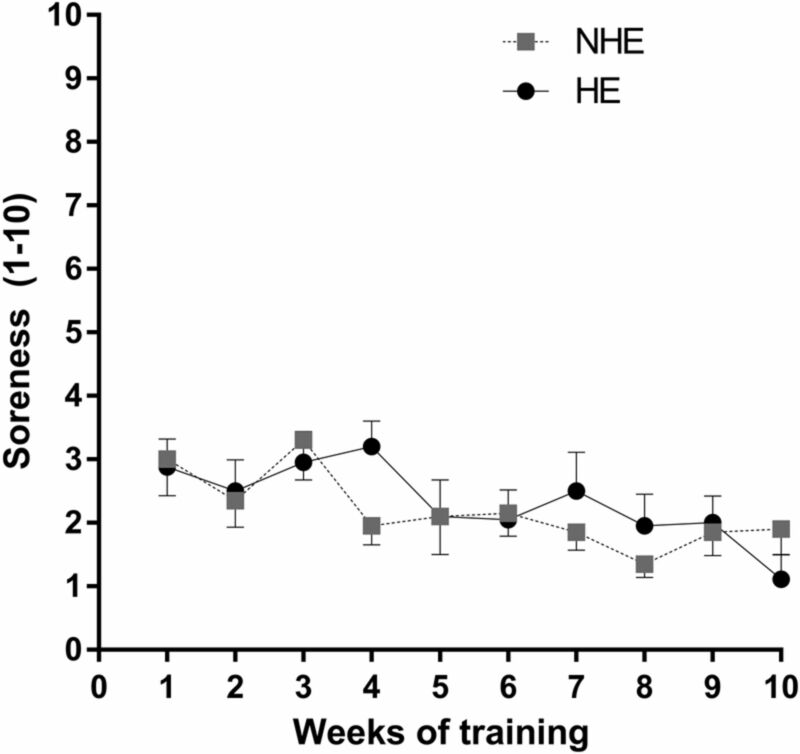 We have provided evidence to suggest that HE and NHE training are effective in lengthening BFLH fascicles and that the greater excursion involved in the HE does not result in greater increases in fascicle length. 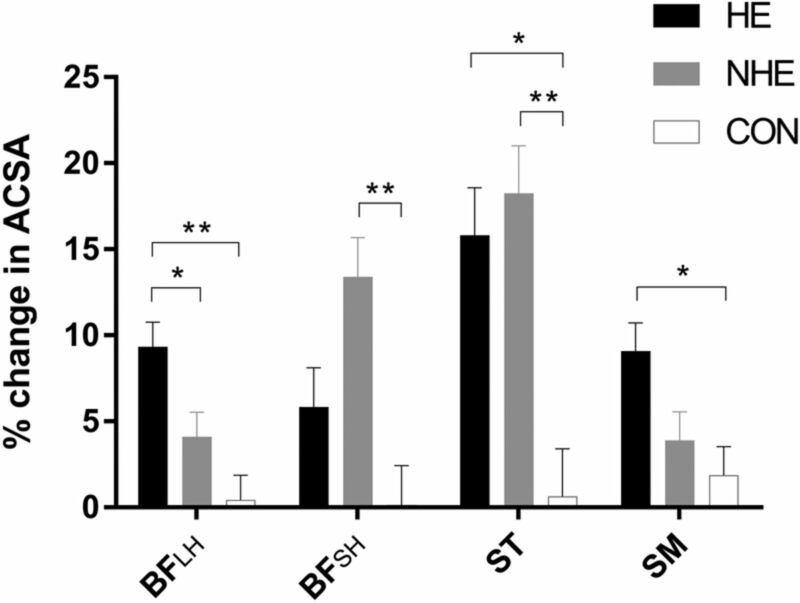 However, HE training appears to be more effective for promoting hypertrophy in the commonly injured BFLH than the NHE, which preferentially develops the ST and BFSH muscles. HE and NHE had very similar effects on ST volume and cross-sectional area. These data may help to explain the mechanism(s) by which the NHE confers injury preventive benefits and also provide compelling evidence to warrant the further exploration of HE-oriented exercises in hamstring strain injury prevention protocols. Future prospective studies are needed to ascertain whether HE training interventions are effective in reducing the incidence of hamstring strain injury in sport and whether or not the combination of HE and NHE training is more effective than the NHE alone. Hip extension and Nordic hamstring exercise training both promote the elongation of biceps femoris long head fascicles, and stimulate improvements in eccentric knee flexor strength. Hip extension training promotes more hypertrophy in the biceps femoris long head and semimembranosus than the Nordic hamstring exercise, which preferentially develops the semitendinosus and the short head of biceps femoris. Hip extension and Nordic hamstring exercise training are both effective in lengthening biceps femoris long head fascicles, and in promoting improvements in eccentric knee flexor strength, which may significantly reduce the risk of hamstring strain injury. Hip extension exercise may be more useful than the Nordic hamstring exercise for stimulating hypertrophy in the commonly injured biceps femoris long head. The authors thank the Queensland Academy of Sport's Centre of Excellence for Applied Sport Science Research for funding this investigation. They also acknowledge the facilities, and the scientific and technical assistance of the National Imaging Facility at the Centre for Advanced Imaging, University of Queensland. Finally, they thank Troy O'Donohue, Casey Sims and all other research assistants who generously volunteered their time for this project.
. A 10-week randomized trial comparing eccentric vs. concentric hamstring strength training in well-trained soccer players. Scand J Med Sci Sports 2004;14:311–17.
. Differences in rat skeletal muscles after incline and decline running. J Appl Physiol 1998;85:98–104.
. Human hamstring muscles adapt to eccentric exercise by changing optimum length. Med Sci Sports Exerc 2001;33:783–90.
. Decline running produces more sarcomeres in rat vastus intermedius muscle fibers than does incline running. J App Physiol 1994;77:1439–44. Contributors MNB was the principle investigator and was involved with study design, recruitment, analysis and manuscript write up. SJD and RGT were involved in data collection. MDW, DAO, GKK and AJS were involved with the study design, analysis and manuscript preparation. AAN was involved in MRI data acquisition. All the authors had full access to all of the data (including statistical reports and tables) in the study and can take responsibility for the integrity of the data and the accuracy of the data analysis. Funding This study was funded by the Queensland Academy of Sport's Centre of Excellence for Applied Sports Science Research. Ethics approval The study was approved by the Queensland University of Technology Human Research Ethics Committee and the University of Queensland Medical Research Ethics Committee. Data sharing statement The authors are happy to share data.